Cook rice according to package directions (usually 1 cup rice to 2 cups water*). Set aside. Preheat oven to 425F. Wrap tofu in a clean towel, add something heavy (I usually use a few heavy cookbooks), and set aside for about 15 minutes to press out some of the water in the tofu. Slice your tofu into cubes or thin squares (like I did). Mix together cornstarch and oil. Add the tofu and coat each piece evenly. Spread tofu on a large baking sheet, lined with parchment paper or a Silplat baking mat. Bake in the preheated oven for about 15 minutes, then flip and bake for another 20 minutes until browned (a nice deep brown is ideal, but not black!). Whisk together the soy sauce, sweet rice wine vinegar, sugar, sesame oil, ginger, and fresh garlic. Then add the cornstarch/water mixture. Bring to a simmer in a small pot. Simmer for 3-5 minutes, until the sauce thickens. Remove from heat and set aside. Steam broccoli & sliced peppers until fork-tender. Set aside. 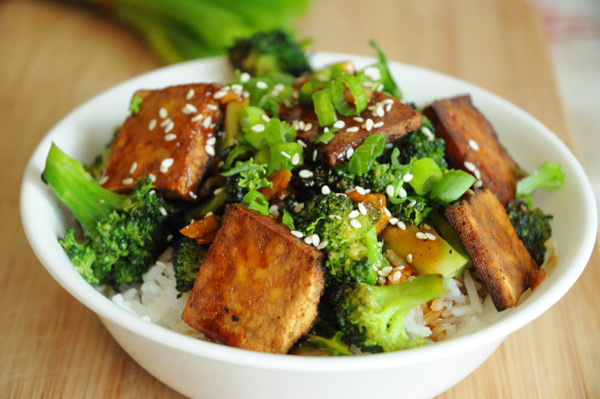 Add rice to your bowls, and top with tofu, broccoli and peppers. Drizzle the teriyaki sauce on top, then sprinkle some sesame seeds and green onions on top.